If you own a staid and boring 991 Turbo or Turbo S and you’re looking for a huge boost in power, want to stand out from the crowd with functional—if ugly—track-focused aerodynamics, and have a whole lot of money to throw at the problem, Gemballa has the solution for you. The new GTR 8XX EVO-R Biturbo is an overboosted overfendered over-the-top machine for the one-percenter with a trackday fetish. Gemballa is the premier name in the Porsche tuning scene, assuming you never really grew out of your 1980s wretched excess phase. Starting with the bodywork, Gemballa added a reworked front bumper, front trunk lid, front lip, cannards, rocker covers, an engine cover insert, fender flares, air intake scoops, a huge wing, and a rear diffuser, all made out of carbon fiber, natch. While no mention of the car’s weight is made, it’s likely the bodywork lost a bit of weight for the car, but the roll cage and larger wheels probably added it back. 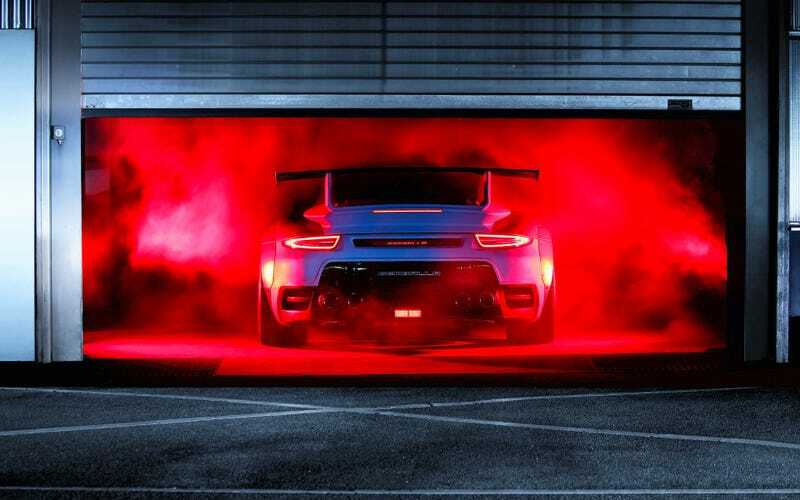 While Gemballa doesn’t mention much about how it was done, the 3.8 liter twin-turbo flat six engine has been “massaged” to produce a mega 818 horsepower, which is up from 580 in a stock 991 Turbo S, and 810 lb-ft of torque, up from 553 lb-ft in showroom form. The standard larger turbo, larger injectors, larger intercoolers are likely employed here, but to greater effect. It’s an impressive set of numbers, for sure. Speaking of good numbers, the GTR 8XX EVO-R BITURBO will accelerate from standstill to sixty-two in just 2.38 seconds. It also takes just 7.5 seconds to make it up to 124 mph. And perhaps most impressively, the Gemballa will streak on to 230 miles per hour at its VMax. The stock Turbo S is positively dreadful by comparison, running 0-62 in 2.7 seconds, 0-124 in 9.3 seconds, and can only go 208 mph MAX. Pitiful. Gemballa will paint your GTR 8XX in pretty much any color, and offer either matte or gloss paints. That’s reassuring. Even better than that, the show car they’ve already built has an incredible chocolate brown interior in it, which is extra good. They have not yet provided a price or availability date, but you can assume it will be quite high. I wouldn’t be surprised to see this package at least double the cost of your brand new 991 Turbo S, which has an MSRP of $191,950. But hey, it’s a throwback to the Gemballas of old, right? Bring an ‘80s mentality, and you’ll be just fine. If you’ve got it, flaunt it. Greed is good.